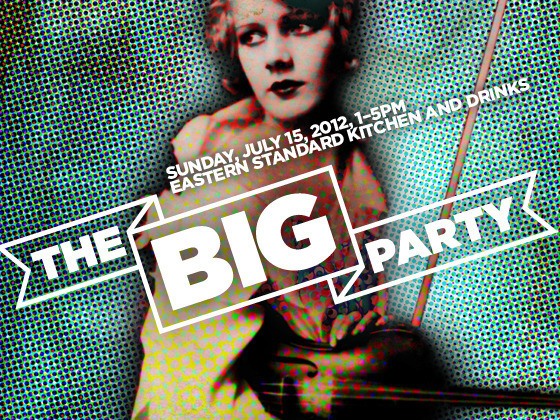 The Big Party – this Sunday with Opus Affair & Eastern Standard! We LUPEC ladies are all about a good time and cocktailing for a cause. We’re also keen on culture, which is why you’re sure to find us this Sunday raising a glass to Boston’s art scene at The Big Party! Opus Affair and Eastern Standard are throwing a fine arts cocktail celebration like Boston has never seen, transforming the entirety of Eastern Standard into a 1920s Gatsby-style garden party with games, food, cocktails, and live music. The fete celebrates outstanding arts organizations that are reaching out to young professionals—and inviting the whole city to join in. Organizations honored will be the Young Partners of the Boston Ballet, Museum Council from the Museum of Fine Arts, H2 from the Handel and Haydn Society, 35 Below from the Huntington Theatre Company, and Young Patrons from the Isabella Stewart Gardner Museum will be honored. Guests will also be invited to weigh in! If you think they’ve missed an arts organization doing outstanding outreach to young professionals, nominate that organization when you purchase your Big Party ticket. Any organization receiving at least 20 nominations will be added to the honoree list and receive a share of the party proceeds. Tickets include an open sponsored bar, featuring beverages from Hendrick’s Gin, Drambuie, St-Germain, Fernet Branca, Notch Brewing, High and Mighty Beer, Bantam Cider, and Narragansett Beer. Food will include passed and stationed appetizers from Eastern Standard, plus oysters from Island Creek. Guests will have a chance to play croquet on the Hendrick’s Patio, enjoy card games in the Drambuie Parlor, pose for photos in the Gallery, watch silent short films in the Screening Room, and listen to music from the Ben Powell Quartet and DJ Ryan Brown. There will be door prizes! Free ticket drawings coordinated by ArtsBoston will feature a wide-variety of Boston-area performing arts organizations. And Every Big Party guest will leave with a gift bag, with special offers, discounts, and giveaways from our sponsors and friends. Tickets, which include all food, drink, door prizes, entertainment, are available for $75 for the general public, but we’re offering our LUPEC friends a 20% discount. To purchase your ticket at the discounted rate of $60, visit opusaffair.org/bigparty and enter the code LUPEC. Codes are only valid for online purchase only. As you ponder your flapper outfit, sip on this Prohibition classic! Shake ingredients in an iced cocktail shaker. Strain into a chilled vintage cocktail glass. Cin-cin! There is a restaurant that serves a Thyme infused Bees Knees. It is really good too!